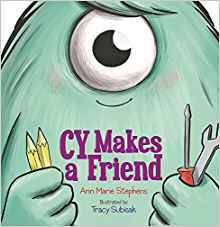 Ann Marie Stephens is the author of the new children's picture book Cy Makes a Friend. Her other books include Scuba Dog. She is an elementary school teacher, and she lives in Fairfax, Virginia. Q: How did you come up with the idea for Cy Makes a Friend, and for your character Cy? A: The notion of writing about a Cyclops came to me like most of my ideas. It was random. Cy jumped out of nowhere and tugged at me off and on for years. If I dig a little deeper then I can say it probably came from a long time love of Greek mythology that started in 7th grade. Combine that with the fact that I am drawn to books where authors take unlikeable characters (like a one-eyed monster) and make them loveable and you have Cy. When the story first started forming I knew I would highlight Cy’s insecurities to make him relatable to readers. Almost everyone has uncertainties when it comes to making new friends. If Cy, with his giant eye and lack of social skills, can put himself out there to make a friend, then anyone can. Q: What do you think Tracy Subisak’s illustrations add to the book? A: Tracy really surprised me with her illustrations... in an amazing way. When I am writing a story I always see images in my head. They help me develop my character. If I can see them, then I will know what they might do or say in any situation I present to them. In my mind, Cy was a traditional Cyclops with a human body, large eye, and hair like Homer Simpson. When I saw Tracy’s sketch of Cy with his furry body, swoopy bang, and adorable smile, my own image disappeared immediately. I was in LOVE! She chose the perfect colors and gave Cy the vulnerability I wanted him to have. My editor and I use the word “love” a lot when we talk about Cy. He has that effect on people. A: Most importantly, I want readers to see themselves in the book. Perhaps they are like Cy. Or maybe, they have no trouble making friends and need to see how hard it can be for other people. Cy Makes a Friend seems to be helping out in the autistic community as well. Parents and teachers have talked to me about how their kids on the spectrum see themselves in Cy. Feedback like this means the world to me. Q: Who are some of your own favorite authors? A: This is an easy one! I’m a super fan of Bob Shea (anything and everything! ), Laurie Keller (Arnie!! ), Lauren Oliver (pure genius), Leo Lionni (every single mouse), Arnold Lobel, (Mouse Tales! ), Ezra Jack Keats, (relatable characters), Pam Munoz Ryan (flawless storytelling), and Holly Goldberg Sloan (beautiful language). A: This is a loaded question for me. I am working on lots of different things. I’m all about what I’m in the mood to work on when I sit down to write. Unless of course I have a deadline, then I don’t have a choice! My current work in progress is a picture book manuscript. It takes place in the ocean and it’s about two creatures that have a perfect symbiotic relationship until a third party “drops in” and complicates things. I’m writing a few other picture book stories too. That way, if I’m stumped on a plot point or even one line in my work in progress, I can jump to another story before I get frustrated. A: I guess I should tell you about my other books. 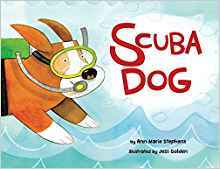 I have Scuba Dog, published by little bee books. 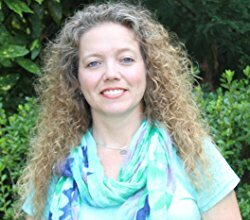 Boyds Mills Press will be publishing two of my books, titled Arithmechicks Add Up and Arithmechicks Take Away, about fuzzy little farm chicks that do math. I’ve been an elementary teacher for over 26 years. I teach first grade which is one of the most challenging yet rewarding ages to teach. Every year my students motivate me to be a good person and teacher while simultaneously wearing me out! I’m also a little obsessed with scuba diving and traveling the world to meet new people and see amazing places. Lastly, I’m so appreciative of people like you, Deborah, for sharing the book love. Authors and illustrators rely on kindness and generosity to keep our books alive! Thank you!